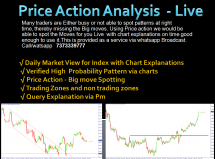 There is no clear Pattern or Price action to trade the Bank Nifty for Intraday traders or positonally for that matter. Certain times are best if a trader can avoid until clear pattern Emerges. Once a pattern evolves, Price actions happening at that location will confirm the validity of the move. Tight range indicates no trade zone. Wait for the kill.